This coming Sunday the Dead Theologians Society will meet for the first time at St. Anthony of Padua parish. The Society is modeled loosely from the film, The Dead Poet's Society. Through the Saints of yesterday, the DTS seeks to inspire the youth of today to become the Saints of tomorrow. I am very excited about this new endeavor! I've had a poster campaign of sorts going on at the high school for about three weeks and the kids are talking about it; we'll see how many come. We'll start this first meeting with a cookout and s'mores in the backyard of the rectory before we hop to it. Please keep this in your prayers. After speaking with my pastor and the principal and guidance counselor of our parish high school, it was decided that, beginning today, I will take over two sophomore religion classes, in addition to the one junior class that I currently teach. This will add considerable work to my load but, in the words of the Holy Father, I will make myself the Lord's "beast of burden." I am confident that he will give me the strength, stamina, and the time to meet the needs of my students. I will also rely heavily on the kindness of your prayers and those of St. Anthony of Padua! During his Angelus address this past Sunday, the Holy Father invited the faithful "to pray for the men and women involved in seafaring, and for their families" on World Maritime Day, Thursday, 28 September 2006. 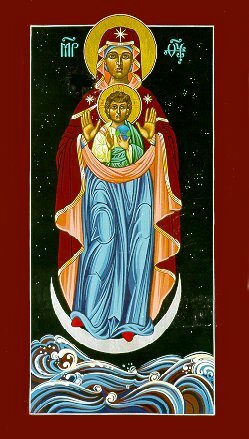 Invoking the aid of the Star of the Sea, Pope Benedict XVI prayed that Our Lady "look down in love upon seafarers and their families and upon all those who care for their human and spiritual needs." Our Lady, Star of the Sea, pray for them! Hail Star of the Sea! Hail Lady Mary,our gentle candle in the darkness! and anger when we are drowning in despair. child-like trust and joyof your son Jesus. 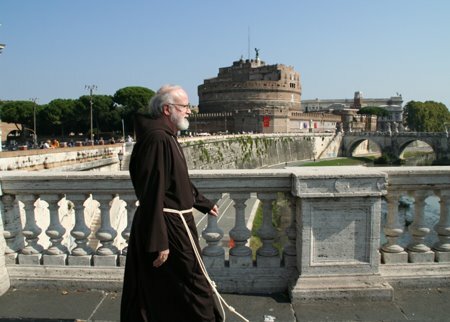 Just in case you've missed it, His Emminence Sean Patrick Cardinal O'Malley, the Archbishop of Boston, is in Rome at this time and he has been blogging his trip. He is, so far as can be known, the first Cardinal to use a blog, and quite possibly the first Bishop as well. I, for one, hope he continues the blog when he returns to Boston. Archbishop Emmanuel Milingo, emeritus archbishop of Lusaka (Zambia), excommunicated himself Sunday in Washington, D.C. when he attempted to ordain four married men to the episcopacy. The official statement from the Holy See may be read here. Today, after offering the Holy Mass and playing hacky-sack (or however you spell it) with some of the high school students, I drove to St. Louis to visit my doctor at St. Louis University Hospital to check up on my arthritis (for more on this read my testimony). A couple of years ago when my classmates and I from the seminary went on pilgrimage in the footsteps of Saints Peter and Paul, we played hacky-sack all over Turkey as we waited for our fellow pilgrims to board the bus. It was a joy to play it again, even though some of the students nearly kicked each other to the hospital. At any rate, I encountered a most beautiful child of God when I arrived at SLU and dropped off my car at the valet parking (it's only $3.00 and I have no idea where else to park!). The woman who came to drive my car began a conversation with me trying to decipher my license plate. As we talked she introduced herself to me and I introduced myself to her as "Father Daren". I left for the hospital dressed like everybody else because a priest in the waiting room of doctor's offices often tends to make people quite nervous and scared, and, being that most people who visit these doctors have serious illnesses, I voted it best to go incognito. This way I also had a chance to finally read more of The Divine Comedy. Perhaps I should have gone in my clerics, but this proved to me a great moment of grace for me. At any rate, the woman, Sandra is her name, said to me, "I thought you were a priest or a minister; you have that glow and look about you." She is a former Catholic who is now a Lutheran who still considers coming back to the Cathoic Church, but her son wishes to remain Lutheran. I suspect there is a long and interesting story behind this. We chatted for quite a while and when another car pulled up behind mine I excused myself to let her return to her work and me to see my doctor. When I returned an hour later we chatted a good deal more. I look forward to seeing her again when I return in March. During our conversation she mentioned that several of her friends suggested to her that she enter some sort of formal ministry. I reminded her that she had a perfect ministry right here at the valet booth. I have seen her a number of times before and she has always greeted me warmly and with a great smile. She is a most welcome sight in such a place. Her warm smile - and often enough her loving hugs - gives patients, myself included, quite a boost. Sandra is certainly not the first person to say that there is something about me that sets me apart from other people, some glow, aura, or something or other. I'm not entirely sure I know what she means or what she saw in me - although I have said the same thing about other priests - but it gives me great confidence to know that my priesthood is not my own, but that of Jesus Christ. This, I suspect, is what she saw in me and for this I am deeply grateful to the Lord. As we pray somewhere in the Liturgy of the Hours: "My life is at the service of the Gospel. God has given me this gift of grace." May he keep me faithful in his service all the rest of my days! Even as Pope Benedict XVI meets with various representatives today from the Muslim world, one pakistani Islamic cleric - Hafiz Hussain Ahmed - said, "If I get hold of the Pope, I will hang him." In light of the current "controversy", George Cardinal Pell says the Church asks for reciprocity. Leonard Pitts has an interesting editorial on the current debate. After a brief respite following the celebration of two Masses and three baptisms, I attend an organ concert at Centenary United Methodist Church in Effingham. The concert was given by Mr. Walt Strony, an accomplished and celebrated organist throughout country, I believe. Mr. Strony played several remarkable pieces, included the brilliant Toccata and Fugue in D Minor by Johann Sebastian Bach. I went to the concert in the hopes of hearing this piece and I am truly happy it was played. Now I am off for another brief respite before the celebration of Mass in less than two hour's time. Why does it often seem that the “good guy” finishes last? The good guy follows all of the rules; he treats everybody with the utmost kindness and consideration; he cheats no one and bends not a single rule. And yet, despite all of his goodness, he is trampled upon, he is ignored and he is passed over. In the end, it seems as though he loses, almost in spite of his goodness. Everyone seems to take advantage of the good guy and they say, “Let us beset the just one because he is obnoxious to us” (Wisdom 2:12). Why is the just one, the good guy, obnoxious to the evildoers? Simply because he does right, he treats people well, and fears and honors God. Goodness is always obnoxious to the wicked because it quietly speaks against evil, simply because it is good. Because of this, the wicked one says of the good, “he sets himself against our doings, reproaches us for our transgressions of the law and charges us with violations of our training” (Wisdom 2:12). The wicked recognize the evil that they do, they see that they do not live as they profess, that they are merely actors who pretend to be just; in the end they are proud and refuse to acknowledge their sin. Consequently the good guy is perceived by them as saying, “You hypocrite and liar,” although he says not a word; their consciences speak against them. Their hearts are restless and they are not at peace and they lash out at the one who seems to be at peace. The very goodness of his life speaks against the lives of the wicked and it condemns wickedness. Wickedness cannot tolerate the good. Jesus Christ came among us as the good guy par excellence; he came not as the proud man but as the humble and because he came as the Good itself he was rejected for speaking against the hypocrites of his day, and he continues to do so today. Because of his goodness and humility he knew that the “Son of Man is to be handed over to men and they will kill him, and three days after his death the Son of Man will rise” (Mark 9:31). It sometimes happens that we find ourselves in a similar situation. We do all that we can to treat others well, to show them kindness and love and all of our efforts of good will are rejected. Our first instinct is to run away and return their wickedness but we ought rather to rejoice when this happens to us for it gives us an opportunity to share in the suffering and the rejection of Christ. It gives us the opportunity to become a little child, to become “the last of all and the servant of all” (Mark 9:35). Here we abandon pride and take on humility. We die with Christ and we rise with him. At other times we find ourselves in the opposite situation. Someone is so pleasant toward us we imagine that they are trying, as it were, to kill us with kindness. We say with the wicked, “Let us beset the just one because he is obnoxious to us.” He cannot possibly be this good, this kind, this loving. It must be an act, we presume, and we begin to look for any instance of hypocrisy for which we might denounce him and prove him wrong. We abandon humility and become proud, becoming hypocrites ourselves. At all times Christ Jesus comes among us and invites us to share in his Cross, to give of ourselves so fully to God and to others that our goodness overflows and gently speaks to the wicked. Never should we run from this mission for love alone will save us, love alone will transform the world. This is what he means when he says, “If anyone wishes to be first, he shall be the last of all and the servant of all.” At the heart of discipleship, at the heart of the following of Christ, lies humility. At the same time, though, the love of Jesus Christ comes among us sinners in the life of the just one who quietly reminds us of our sins and calls us to repentance. Here again our temptation is not to change our own life, but rather to lunge out against those who are just, searching for their own sins with which to attack them in the attempt to ignore our own sin. “Where do the wars and conflicts among come from? Is it not from your passions that make war within your members? You covet but do not possess. You kill and envy but you cannot obtain; you fight and wage war. You do not possess because you do not ask. You ask but do not receive, because you ask wrongly, to spend it on your passions” (James 4:1-3). James knows that the wars and conflicts among us come from our pride, from our refusal to be humble and lower ourselves as Jesus himself did, to love and serve God and our neighbor. To be humble is really to recognize who we are before God, fully aware of our sinfulness and our faithfulness. To be humble before the Lord is to be aware of our need for his love, for his mercy and forgiveness. It is to be like a young child fully dependent on his or her parents. “Observe a tree, how it first tends downwards, that it may then shoot forth upwards. It fastens its root low in the ground, that it may send forth its top towards heaven. Is it not from humility that it endeavors to rise? But without humility it will not attain to higher things. You are wanting to grow up into the air without a root. Such is not growth, but a collapse” (Sermon on the Gospel of John, 38). We must put down our roots into the firm foundation of Christ and his humility. If we, like Christ, humble ourselves and live in love as the servants of all – not as the judges – we will grow tall in the kingdom of heaven. The Psalmist encourages us in this endeavor to grow in humility, saying to us: “Behold, God is my helper; the LORD sustains my life” (Psalm 54:6). To this way of life the Lord has called us and he will give us the grace – if we ask sincerely and in humility – to follow faithfully after his Son and so lead others to salvation. We have lost yet another teacher at our high school this year, this time on account of pressing health issues. Consequently, the principal has asked me to take over at least one class of sophomore religion, and possibly even a second (I should know for sure on Monday). I currently teach one section of junior religion which covers Church history and the Sacraments. Sophomore religion covers the New Testament and social justice. I take over the sophomore class on Wednesday and am really looking forward to it. I had hoped to teach more than one class this year and it looks like my desire is coming to fruition! Last evening I traveled with our soccer team to an away game in Raymond, Illinois. It was an enjoyable evening but the team unfortunately lost the game. They played the first of what should have been two games, but threatening weather canceled the second. As I sat on the bench with the team we watched both the game and the skies, searching for the formation of thunderstorms and possible tornadoes, arguing with one another as to what the skies portended. On the way to the game I was able to finish reading a couple of books and I typed this post on the bus on the way home. I may have to do this more often (it’s not bad at all traveling and not having to drive!). This way I am able both to visit with the students and get some work finished. I was even able to write half of my homily. This is the life! 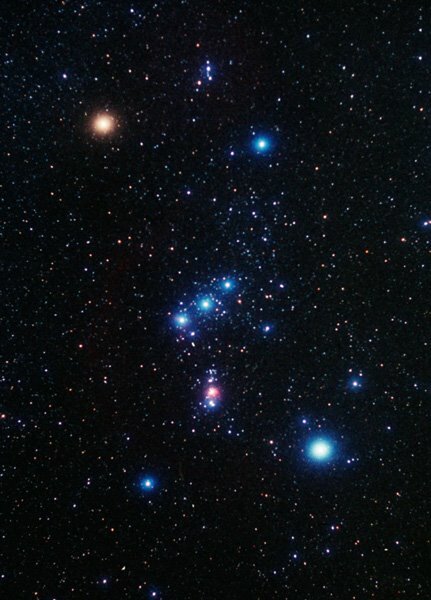 For anybody who happens to be up in the early hours of the morning - before dawn, say, perhaps, to turn the lights on in the church - and who also happens to look up to the heavens something new should strike your eye: the constellation Orion. Orion is, quite easily, my favorite constellation and has been for as long as I can remember. He is also - most unfortunately - a winter constellation, meaning that we in this hemisphere see him throughout the winter nights and in the summer he is gone from our view. The fact that he is now rising in the early morning is a clear omen of pending doom: the death that is winter, but I shall enjoy him nonetheless. Several worthwhile stories continue to emerge concerning the Holy Father's lecture at the University of Regensburg during his return to his native Bavaria. Mehmet Ali Acga, the man who attempted to assasinate the Servant of God Pope John Paul II warned Pope Benedict XVI that his life is in danger and that "for your own welfare you must make a grand gesture of honour and resign". Apparently speaking the truth is not worth it. Acga even suggests whom the next Pontiff should be. The "Army of Guidance," comprised of Muslim militants formed in Gaza to attack Christian faithful and places until the Pope apologized. Now that he has, I don't expect that they'll disband. Abdallah Redouane, the leading Muslim in Italy, accepted the Holy Father's apology and said "the way to dialogue has been reopened". Islamic clerics in Pakistan - some one thousand or so of them - say Pope Benedict XVI must go because of his "insulting remarks". Can we demand their removal when they insult Christianity? 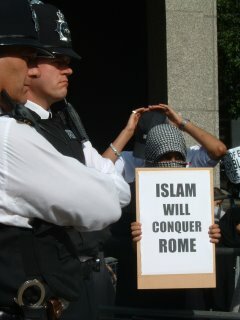 The group's statement said the "pope, and all infidels, should know that no Muslim, under any circumstances, can tolerate an insult to the Prophet (Muhammad). ... If the West does not change its stance regarding Islam, it will face severe consequences." Translation: it's back to Muhammad's way of spreading his new religion, convert or die. Yesterday afternoon I returned from Springfield from our annual presbyteral convocation. The topic this year - and seemingly for the next several years - focused on building trust and unity within the presbyterate, certainly a worthy topic. I return quite exhausted. The schedule for Wednesday allowed - quite literally - two hours of available "free" time the entire day. I must still see to the two worst details of returning from time away: unpacking and going through the mail. More threats and acts of Muslim violence have occurred. Stories are here (a second story here) and here. There is yet another call for the Pope's murder here, and a Turkish (Turkey being, of course, a 'moderate' Islamic State) best-selling novel speculates on who will kill the Pope in his visit to Turkey at the end of November. To discern what the Holy Father really thinks about Islam, read his address he gave in Cologne last year in a meeting with representatives of the Muslim community. Sandro Magister has an excellent piece regarding "Islam's unreasonable war against Benedict XVI" here. 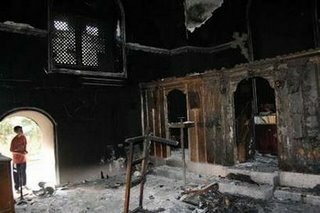 In the past several days Muslims have erupted in a rash of violence against Christians. Do followers of a peaceful religion kill a 70-some year old nun? All of this has occurred since the Pope's address at the University of Regensburg. I'm saying one way or the other; I'm only asking the question. You can answer for yourself. It is now the fourth year of the reign of the Emperor Darius, what we would now consider the year A.D. 72. Jesus was crucified in Jerusalem almost forty years ago and the great Temple in Jerusalem was destroyed only two years ago. Peter and Paul have both been killed in Rome and yet the new religion based on the life of this man named Christos still spreads throughout the Empire. In an effort to curtail this new and dangerous religion, His Excellency, the Emperor, has accused four inhabitants of the Province of Gaul (roughly modern-day Spain) and citizens of the Roman Empire – namely, Antonius, Suetonius, Caecilia and Irminia - of being members of the group known as Christians. On Wednesday, the 27th of September the Emperor will arrive in Gaul to preside over the trial to be judged by the Governor of Gaul, Saturninus. After Saturninus hears the case brought before him, Emperor Darius will either confirm his judgment or over turn it. Throughout this week, the students are to imagine themselves as ancient Romans who are now involved with this case. All students have been assigned a role in the trial and are to prepare themselves fully for the trial next Wednesday. Everyone is to cooperate with the attorneys – both defense and prosecution – and be well prepared to participate seriously in the trial, though enjoying him or herself at the same time. The attorneys will have to speak with their respected witnesses as well as the accused in the preparation of their cases. Extra credit will be given to those students who dress in the costume of ancient Rome for the day of the trial. To help prepare for the trial, every student is expected to read pages 65-72 in the textbook. In addition to the text, each person will be given a fact sheet to help them prepare. The students must fill in whatever information might be missing in order to complete the assignment. This will require the use of the imagination and intellect, both of which are often underused today. I expect it should be a great deal of fun; what think you? We did something like this when I was in high school with the trial of Joan of Arc...we burned her. The London Times has an editorial worth reading for a clearer perspective on the Holy Father's address at the University of Regensburg that has militant Muslims up in arms, even calling for the murdering of the Pontiff. If you have not yet read the Holy Father's speech to the University you really should. It might take a time or two to get through it, but it is a brilliant discussion on the relationship of faith and reason, and a good critique of the current culture of the "west". To read the Vatican Secretary of State's clarification of the Holy Father words, go here. For a good discussion of the Pope's address, go here and here. Amy over at Open Book has a great list of links and discussions and from her I have taken these. Thanks, Amy! For several violent Islamic reactions - which might seem to validate the thoughts of the Byzantine Emperor quoted by the Holy Father - go here, here, and here. Despite the fact the Muslims claim to be peaceful, it is rather ironic that the primary way they react to a scholarly address in a university setting that criticizes not Islam but the relationship between faith and reason is through violence and threats of death and destruction even after an apology has been issued. When was the last time they apologized for the actions of even a small handful of Muslims, say the 9-11 attacks, the London bus bombing, the Madrid train bombing, etc., etc., etc. Simply look back to how Islam spread in its first decades: you have two options, it was said, convert or die. That does not sound like a religion of peace to me. It was announced in yesterday's edition of the Catholic Times (no article online) that the Presbyteral Council met on September 5th and gave its consent to a plan to merge three parishes in my home city of Quincy, Illinois - including my home parish - into one parish. All Saints (formerly St. John the Baptist [my home] and St. Rose of Lima parishes), Immaculate Conception and St. Boniface parishes are now, after a decree from Bishop George J. Lucas, united into the parish of Blessed Sacrament, using the church dedicated to the Immaculate Conception. Word is that my home church will be sold in the not too distant future. It breaks my heart that this plan went through. It all happened so quickly and the people are very hurt and confused, myself included. I accept the Bishop's decision, though I do not understand it. In this church I learned that God is love. In this church I learned that God loves me. From this church my mother was buried. In this church I made my first Confession. In this church I received the Holy Eucharist for the first time. In this church I learned to pray. From this church my grandfather was buried. From this church my cousin was buried. From this church I hoped to be buried. In this church I learned to serve the Holy Mass. In this church I found joy. In this church I found comfort. In this church I found peace. In this church I found my fulfillment. In this church I heard God’s call. In this church I responded to his call. In this church I understood the unity and bond of the Mystical Body of Christ. In this church I received the Anointing of the Sick. From this church I was sent forth to study and be formed for the priesthood of Jesus Christ. In this church I celebrated my first Solemn Mass of Thanksgiving. In this church I wept and laughed and loved and prayed and listened and preached and was loved. In this church I am at home. In this church is all I have and all I have known and all I have loved. In this church is my home. I have placed on a new poll on my web site. Please visit the site and vote. Thanks! We have much to learn from the example of the life of Saint Peter, for he is man very much like us. He has a determined and impulsive character: he is ready to assert his own opinions even with force (remember him using the sword in the Garden of Olives: cf. John 18:10ff). At the same time he is also ingenuous and fearful, yet he is honest, to the point of the most sincere repentance (cf. Matthew 26:75). After the miraculous catch of fish, Peter accepted the invitation of Jesus to trust and to be open to a project that would surpass all his expectations. "Do not be afraid; henceforth, you will be catching men" (Luke 5: 10). He accepted this surprising call, he let himself be involved in this great adventure: he was generous; he recognized his limits but believed in the one who was calling him and followed the dream of his heart. He said "yes", a courageous and generous "yes", and became a disciple of Jesus. He said, “yes” to Jesus because in him he saw the fulfillment of his deepest desires and dreams. It is a rather strange question that Jesus asks: “Who do men say that I am?” (Mark 8:27). Why ask such a question at all? He surely has heard the rumors among the people, that he intrigues even Herod. For Jesus, hearsay did not suffice. From those who follow him and are in relationship with him, Jesus insists that we personally say who he is for us, that we recognize the relationship we have with him. He asks us directly and pointedly, “But who do you say that I am?” The answer to this question undoubtedly reflects our relationship and our intimacy with the Lord. Some may indeed see him as “one of the prophets” (Mark 8:28); some as a miracle-worker or great teacher; some as a glutton and a drunkard. However, he calls each of us, with Peter, to recognize him for who he truly is: the Messiah of God. “You are the Christ,” Peter said (Mark 8:29). However, Peter had not yet understood the profound content of Jesus’ Messianic mission, the new meaning of this word: Messiah. He thought he knew who this Jesus was and his mission, but Peter was mistaken, seeing instead his own vision for Jesus. He demonstrates this a little later, inferring that the Messiah whom he is following in his dreams is very different from God’s true plan; he follows, at first, a savior of his own design. He was shocked by the Lord’s announcement of the Passion and protested, prompting a lively reaction from Jesus (cf. Mark 8:32-33). Do we not do the same? Peter wanted as Messiah a “divine man” who would fulfill the expectations of the people by imposing his power upon them all: we would also like the Lord to impose his power and transform the world instantly. Jesus presented himself as a “human God,” the Servant of God, who turned the crowd’s expectations upside-down by taking a path of humility and suffering. He came among us as the Suffering Servant. This is what Jesus said to the Apostles when “he began to teach them that the Son of Man must suffer greatly and be rejected … and be killed and rise after three days” (Mark 8:31). This mission Peter simply could not tolerate. And yet, this is the great alternative that we must learn over and over again: to give priority to our own expectations, rejecting Jesus, or to accept Jesus in the truth of his mission and set aside all too human expectations. Can you, can I, accept the totality of Jesus and his mission? Or are we like Peter, telling the Lord how to do his work? Peter, impulsive as he was, did not hesitate to take Jesus aside and rebuke him. Jesus’ answer demolished all his false expectations, calling him to conversion and to follow him: “Get behind me, Satan! You are thinking not as God does, but as human beings do” (Mark 8:33). It is not for you to show me the way; I take my own way and you should follow me. Like Peter, we too have a desire for God, we too want to be generous, but we too expect God to be strong in the world and to transform the world on the spot, according to our ideas and the needs that we perceive. God chooses a different way. God chooses the way of transformation of hearts in suffering and in humility. And we, like Peter, must convert, over and over again. We must follow Jesus and not go before him: it is he who shows us the way. So it is that Peter tells us: You think you have the recipe and that it is up to you to transform Christianity or the world, but it is the Lord who knows the way. It is the Lord who says to me, who says to you: follow me! And we must have the courage and humility to follow Jesus, because he is the Way, the Truth and the Life, because he is the Christ. Those of you who - together with me - consider yourselves a "Far Side Freak" will be especially ecstatic to read this, the Far Side being, of course, the superb comic strip by Gary Larson of a few years back. While browsing this afternoon at Barnes & Noble my eyes fell upon a truly beautiful sight: a page-a-day Far Side calendar for 2007. My fellow freaks will be aware that there has not been such a calendar in five years now, and the pain only grows with each passing year. It does not sound as though this will be an annually publication, much to the degradation of mankind. The calendar for 2007 is a reprint of the 2001 calendar and the proceeds will go to benefit a wildlife conservation fund, or something like that; I cannot recall. That, however, is not the important part. What is important is that we can at long last begin our day again with a deep and hearty laught. It may well be that the worst decision made by the senior president Bush was allowing Gary Larson to retire from his comic writing days. Mr. Bush should have used an executive order to force Larson to continue writing his comic until the day he died. I've said this before and I will stand by it. 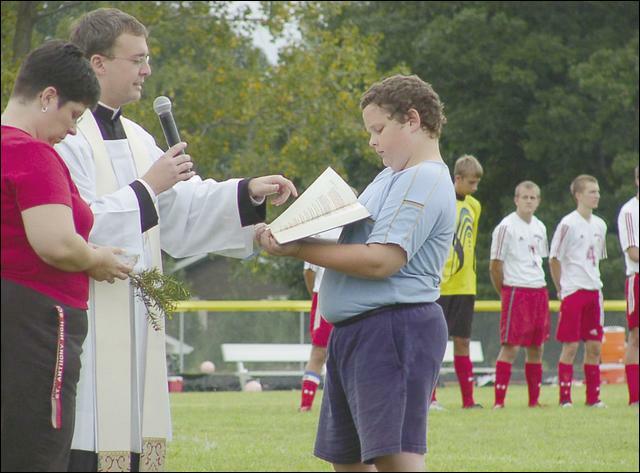 Yesterday afternoon, just prior to the first home game, I had the pleasure of blessing the new soccer field of St. Anthony of Padua High School. The Effingham Daily News ran this story about the blessing. Although our soccer team did not win the match yesterday, they played well. Keep it up guys! There is something that draws me to Pope Benedict XVI, something that draws me to him even more than I was drawn to Pope John II. I am not entirely sure that I can put it into words, but I will do what I can. The more that I read the current Holy Father and watch him as he carries out his ministry the more attracted I am to him. I feel somehow connected to him. Much of what he says resonates deeply within me; what he says I know to be true. It seems to me that John Paul II was a philospher to his core, and philosophers have never much attracted me. Benedict, on the other hand, seems to be a poet to his core and this shines marvelously through his homilies, speeches and books. There is a mark of quiet confidence about Pope Benedict, and yet it is a confidence that also clearly needs direction from time to time. If you watch carefully, you can see the Holy Father look toward Archbishop Marini, the papal master of ceremonies, with a child-like look that seems to ask, "What do I do now?" And then Benedict confidently strides away. Pope Benedict has described himself several times as the Lord's beast of burden, an image I find particularly appealing and one to which I relate well. 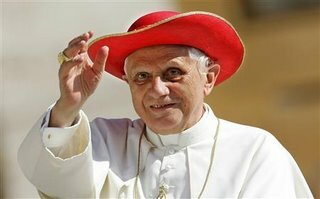 The Holy Father will do all that is asked of him even if he would rather retire to the mountains. It is, perhaps, this resolve to lay his own desires aside that draws me to him. He has been called the "smiling Pope" by some because Benedict always has a warm and genuine smile ready to radiate his love. There is also a quiet humor to him, never boisterous or over-the-top, but always present nonetheless. He knows the seriousness of his mission but he takes himself none too seriously. I cannot help but think - and truly believe - that if the Holy Father and I knew each other that we could quite easily be very good friends. I should very much like to sit down with Pope Benedict for a brief visit or even a good game of chess. This Holy Father inspires me deeply and never ceases to teach me new things or to remind me of old things, all the while keeping the focus on Christ Jesus. Ad multos annos, Heilege Fater! The Apostle Philip, said Pope Benedict XVI, "invites us to let ourselves be conquered by Jesus, to be with him and to share this indispensable company. In this way, seeing, finding God, we can find true life." 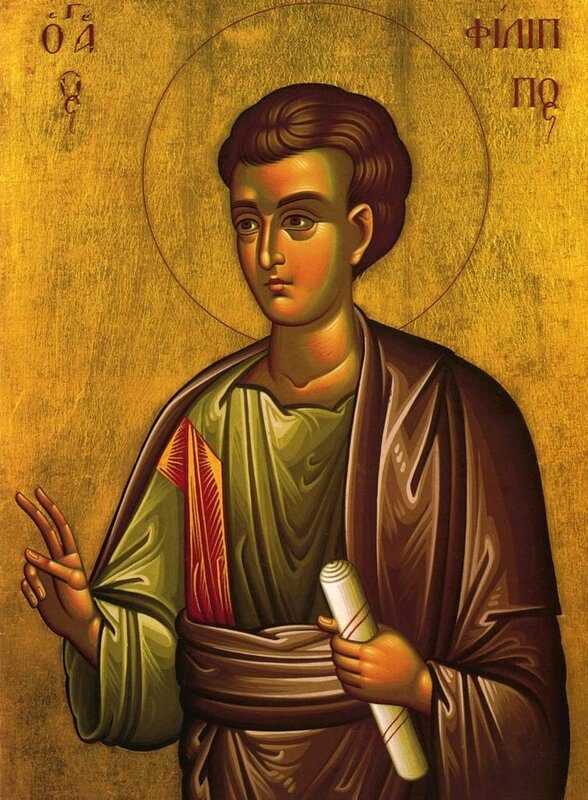 Every authentic witness of Jesus Christ can follow the example of Saint Philip: "He is not content with presenting the announcement as a theory, but questions the interlocutor directly, suggesting that he himself have the personal experience of what was proclaimed." In this way, "the Apostle commits us to know Jesus up close." The Bishop of Rome remarked last Wednesday that "intimacy, familiarity, custom, make us discover the true identity of Jesus Christ." We come to realize that Jesus "is not only a Teacher, but a Friend, more than that, a Brother." When encountering Jesus Christ, "what is important," said the Holy Father, "is not only or above all to listen to his teachings, his words, but to know him personally, that is, his humanity and divinity, the mystery of his beauty." Philip served as an intermediary between Jesus and those who sought to know the Son of God. Philip brought others to Jesus and "this teaches us also to be willing both to accept requests and invocations, wherever they come from, as well as to direct them to the Lord, as only he can satisfy them fully. It is important, in fact, to know that we are not the last recipients of the requests of those who approach us, but the Lord: We must direct to him those who are in difficulties. Each one of us must be an open path to him!" With the Apostle Philip, let each us say, "Come and see." Saint Philip, pray for us! Jesus “looked up to heaven and groaned, and said to [the deaf man], ‘Ephphatha’” (Mark 7:34). Why does Jesus groan as he looks up to heaven? This is not the first time he has done something like this. When he arrived after the death of his friend Lazarus, “at the sight of [Mary’s] tears, and those of the Jews who followed her, Jesus said in great distress, with a sigh that came straight from the heart, ‘Where have you put him?’” (John 11:33 [Jerusalem Bible]). In the encounter with the deaf man and the encounter with the weeping women, Jesus experienced the pain of the human heart; he knew the agony of loss and the misery of suffering. Standing before the effects of sin, Jesus’ love for his suffering people is clearly revealed and made known, a love that goes all the way to the Cross. This is why the people brought the deaf man to him and “begged him to lay his hand on him” (Mark 7:32). They had already seen the power of Jesus’ love heal others who were sick and even raise the dead. Now they wanted this tender healing touch of love to restore this man, too. Have you ever looked at miracle accounts in the Gospels and wondered why Jesus healed those specific people? There seems to be nothing especially significant about these people, at least not by human standards. When healing his people, Jesus often said such things to them as, “Daughter, your faith has saved you; go in peace” (Luke 8:48) and, “O woman, great is your faith! Let it be done for you as you wish” (Matthew 15:28). Just as it was then, so it is now. Jesus looks upon us to see our faith. In the eyes of Jesus it is not our social standing that matters; it is not our wealth that matters; it is not our education that matters; it is not the clothes we wear that matters; it is not our lake house that matters or our vacation home; it is not our athletic ability that matters; what matters is faith. Faith is always to be our highest priority, our deepest focus; faith is to drive every aspect of our life. This is why the first Bishop of Jerusalem instructs us to “show no partiality as you adhere to the faith in our glorious Lord Jesus Christ” (James 2:1). The spiritual father of Saint Anthony of Padua, Saint Francis of Assisi, was fond of this saying and repeated it often: “What a man is in the eyes of God, that he is and nothing more.” When we truly begin to consider this statement and to reflect upon it in prayer a much larger world and a clearer vision opens up before us because then we will recognize the presence of Christ shining through each person around us calling out for encouragement, for support, for love. This saying is visibly shown in the funeral rites of the Church. When the body of the deceased is brought into the church for the last time, the funeral pall – the white garment – is draped over the casket. It symbolizes two things: the white garment we received at baptism when we were “clothed in Christ”; and that in the eyes of God we are all equal. Each deceased person of whatever rank or status looks the same at death and wears the same clothes. What a man is in the eyes of God, that he is and nothing more. Through the waters of Baptism each of us is united to Christ Jesus and becomes a member of his Body, the Church. 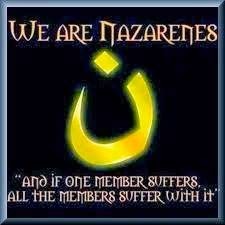 As such, we are united not only to Christ, but to each other as well. We are one in Jesus Christ because we are his body, his mystical body. When we show partiality to those among us and around us, we neglect Christ Jesus because as he himself says, “whatever you did for these least brothers of mine, you did for me” (Matthew 25:40). How does this happen? How do we become one and how do we serve Christ? Love of neighbor is thus shown to be possible in the way proclaimed by the Bible, by Jesus. It consists in the very fact that, in God and with God, I love even the person whom I do not like or even know. This can only take place on the basis of an intimate encounter with God, an encounter which has become a communion of will, even affecting my feelings. Then I learn to look on this other person not simply with my eyes and my feelings, but from the perspective of Jesus Christ. His friend is my friend. Going beyond exterior appearances, I perceive in others an interior desire for a sign of love, of concern. This I can offer them … Seeing with the eyes of Christ, I can give to others much more than their outward necessities; I can give them the look of love which they crave (Deus caritas est, 18). From where does this look of love come? It comes from Christ Jesus and from faith in his love for me. Believing and knowing that Jesus loves me I can share his love with everyone. Have you experienced the love of Christ? Have you opened your heart to him and invited him to dwell within you? He will not force his way in; he awaits the humble invitation. In the end, it becomes a question of love. Do I want to know the power of the love of Jesus Christ? Will I allow myself to be overcome with love? Will I allow myself to be vulnerable so that I might love? Will I allow myself to love with reckless abandon as Jesus loves? In order for this love to flow, we must be in relationship with Christ. If I have no contact whatsoever with God in my life, then I cannot see in the other anything more than the other, and I am incapable of seeing in him the image of God. But if in my life I fail completely to heed others, solely out of a desire to be “devout” and to perform my “religious duties”, then my relationship with God will also grow arid. It becomes merely “proper”, but loveless. Only in my readiness to encounter my neighbor and to show him love makes me sensitive to God as well. Only if I serve my neighbor can my eyes be opened to what God does for me and how much he loves me. The saints – consider the example of Blessed Teresa of Calcutta – constantly renewed their capacity for love of neighbor from their encounter with the Eucharistic Lord, and conversely this encounter acquired its real –ism and depth in their service to others. Love of God and love of neighbor are thus inseparable, they form a single commandment. But both live from the love of God who has loved us first … Love grows through love. Love is “divine” because it comes from God and unites us to God; through this unifying process it makes us a "we” which transcends our divisions and makes us one, until in the end God is “all in all” [I Corinthians 15:28] (Deus caritas est, 18). I have never really enjoyed wearing shoes, preferring sandals or simply a pair of socks. It’s not too uncommon to see my wandering around in the office in my socks with my shoes sitting quietly in the corner of my office. Every now and again I cannot help but wondering if shoes are really the invention of the devil (and if winter is the result of the Fall); today has been one of those days. I have it on good authority that this week Steak ‘N Shake restaurants will again offer the caramel apple shake. If you haven’t yet had one, run out right now to your nearest Steak ‘N Shake and try one – they’re quite delicious! Ordinarily I very rarely – if ever – actually finish a milkshake, despite the fact that I do like them, but this shake is entirely another matter. The first time I had one the straw did not leave my lips until the milkshake was finished! After celebrating the morning Masses Sunday I packed up and headed home to Quincy, known by some as Hobbiton. J.R.R. Tolkien was said, “I am, in fact, a Hobbit, in all but size”; those words I make my own. Sunday evening my family had a cookout. I am pleased to say that everyone is doing well, and little Matthew is growing well – and eating a lot! Monday evening I had dinner with a several couples with whom I have been great friends and whom I first met through Great River Teens Encounter Christ. We went to the Tower of Pizza, a most enjoyable Quincy tradition. Just a quick post to say that I am still around. I returned yesterday from a brief return home. All is well, I'm happy to say. It's been a busy day today and promises to be the same again tomorrow. I'll post more when I have a chance, but to keep you amused here's a picture for you. Pope Benedict XVI continues to pull out the tradition vesture of the Roman Pontiff. I say, "Keep it coming, Holy Father!" Now, Israel, hear the statutes and decrees which I am teaching you to observe, that you may live, and may enter in and take possession of the land which the LORD, the God of your fathers, is giving you (Deuteronomy 4:1). Two things should be noted here. First, these statutes and decrees do not come from Moses himself, but from the Lord God; these are the commandments of the Lord, which he gives to his people through his servant, Moses. Moses is not being domineering or controlling, but is, rather, fulfilling his sacred duty as the Lord’s messenger. Second, these commands are not given to the people to oppress them or to take away their freedom, but to give them life, that they may live. If this is so, we must ask the question, “What is freedom? What does it mean to be free?” Freedom, as most often consider it, is the ability to do whatever I want whenever I want and however I want, with nobody telling me otherwise. Freedom does not involve the truth because I am free to choose the truth; freedom does not involve other people because I can do what I want, and it certainly does not involve God because he takes freedom away. This, of course, is complete nonsense. Freedom must always involve the truth. Freedom also always involves other people because we are social beings and every decision we make – even the seemingly insignificant – affects at least one other person. Freedom must also always involve God for he alone is the source of freedom. the power, rooted in reason and will, to act or not to act, to do this or that, and so to perform deliberate actions on one’s own responsibility. By free will one shapes one’s own life. Human freedom is a force for growth and maturity in truth and goodness; it attains its perfection when directed toward God, our beatitude. As long as freedom has not bound itself definitively to its ultimate good which is God, there is the possibility of choosing between good and evil, and thus growing in perfection or failing and sinning. This freedom characterizes properly human acts. It is the basis of praise or blame, merit of reproach (no. 1731-1732). Freedom, then, is the ability, the choice, to do good or to do evil. And, of course, “The more one does good, the freer one becomes” (no. 1733) because human freedom is aimed at doing good, at doing the will of the Lord for our lives and only in doing his will are we truly free. On the contrary, Christian faith and ethics do not wish to stifle love but to make it healthy, strong and truly free: this is the exact meaning of the Ten Commandments, which are not a series of 'noes' but a great 'yes' to love and to life. It seems to us that God takes away our freedom but in reality the commandments are given to us to make us free. How? The Commandments of the Lord show us the difference between good and evil and by knowing the good we can then choose it. We are free to do good, we are free to do the will of the Lord, we are free to live as God has created us to live. The Apostle James encourages us to “humbly welcome the word that has been planted in you and is able to save your souls” (James 1:21). He encourages us to “be doers of the word not hearers only” (James 1:22) for “he who looks into perfect law, the law of liberty, and perseveres, being no hearer that forgets but a doer who acts, he shall be blessed in his doing” (James 1:25). In other words we must keep the commandments by fulfilling them and living a life worthy of the Lord Jesus Christ. the history of the love-relationship between God and Israel consists in this, at the deepest level, in the fact that he gives her the Torah[the Law], thereby opening Israel’s eyes to man’s true nature and showing her the path leading to true humanism. It consists in the fact that man, through a life of fidelity to the one God, comes to experience himself as loved by God and discovers joy in truth and in righteousness – a joy in God which becomes his essential happiness. If we let Christ enter fully into our lives, if we open ourselves totally to him, are we not afraid that He might take something away from us? Are we not perhaps afraid to give up something significant, something unique, something that makes life so beautiful? Do we not then risk ending up diminished and deprived of our freedom? … No! If we let Christ into our lives, we lose nothing, nothing, absolutely nothing of what makes life free, beautiful and great. No! Only in this friendship are the doors of life opened wide. Only in this friendship is the great potential of human existence truly revealed. Only in this friendship do we experience beauty and liberation. … Do not be afraid of Christ! He takes nothing away, and he gives you everything. When we give ourselves to him, we receive a hundredfold in return. Yes, open, open wide the doors to Christ - and you will find true life. Amen. Pope Benedict XVI, Address to the Participants at the Ecclesial Convention of the Diocese of Rome, 5 June 2006. Pope Benedict XVI, Deus Caritas Est, no. 9. Toward the end of the week I told a few of our soccer players from the parish high school that I would attend their game this morning, fully expecting to acomplish a great deal on Thursday and Friday, which - naturally - did not happen. I told them I would be unable to stay for the entire game, but that I would certainly be there. Suffice it to say that this morning I felt entirely unready to go to the game, having a great many other things to attend to before I leave for a brief return home tomorrow early afternoon. Even with a mounting pile of work to sort through before I hit the road, I went to the game and enjoyed myself there for about an hour chatting with students and parents before I returned to the parish to meet with a couple for marriage. Now, my homily is ready for the Masses and the pile of work is strangely being sorted through rather quickly. I love it when the Lord allows me to keep my promises and still get my work finished (and still post a blog)! On a side note, of all of the sports that I do not like (I've never been a sports fan), soccer is the one that I like the most. If I see a soccer game on the television I am more likely to stop and watch it than anything else. I'm not entirely sure why. Perhaps it's the part of me that wishes I were European? If I get really ambitious, I may travel with the team to one of their away games. Apparently the United States Conference of Catholic Bishops teamed up with the Mexican Conference of Bishops in 2003 to write a pastoral letter entitled Strangers No Longer: Together on the Journey of Hope (who knew?). I discovered it this morning while opening my mail. The latest issue of Catholic Update is a condensed form of the letter. The pastoral letter concerns the migration of peoples. If the debate around immigration reform interests you, give the letter a read. In 1887 the Reverend Theodore Bruener finished his History of the Catholic Church in Quincy in Germany. His book covered the history of the Catholic Church in Quincy, Illinois from the early 1830s through the year 1887. Mr. Lester Holtschlag, who has our undying gratitude for his magnanimous efforts, has published his tranlation of the German to English. In her review of the translation, Sr. Susan Karina Dickey, O.P., the Archivist of the Diocese of Springfield in Illinois, notes, "Even if you aren't from the Gem City, you'll enjoy this book with its 33 illustrations if you're the least bit history minded." You can purchase a copy of the book by sending $22.50 (includes shipping) to the Great River Genealogical Society, c/o the Quincy Public Library, 526 Jersey Street, Quincy, Illinois 62301. "Our faith shines as a light on our path each day and we can offer it as a light to others, if we know what we believe and how to talk about what we believe," says the Most Reverend George J. Lucas. To know what we believe Bishop Lucas recommends both the Compendium of the Cathechism of the Catholic Church and the United States Catholic Catechism for Adults. The question and answer format of the Compendium "will seem familiar to older Catholics." This format, says the Bishop of Springfield in Illinois, "shows that we should be asking sincere questions about what Catholics believe. These questions are indications that our faith, which is God's gift to us, is seeking understanding." These questions we ask do have answers, he says, and these are presented in the Compendium. Bishop Lucas expects that those "who make use of" the U.S. Catholic Catechism for Adults "will find it both practical and inspirational."